The ground was filling up with piles of white crystal snow and the leaves were drenched in beautiful hoare frost while the skies were moody and grey. It inspired Jacqueline Rae Weddings Events Interiors to pair warm luxurious furs contrasted with cold colored leather and pops of dusty blues and bold coppers as she designed the shoot. Our venue, Bonterra Trattoria was an incredible outdoor patio with corner fireplaces and lush gardens stricken by the winter cold. As the snow started to trickle down it coated our tablescape and created a light frost on the navy lamour tablecloth from Bella Linens. Paired with moody grey dinnerware on top a marble charger accented with matte black flatware and sapphire goblets from Modern Luxe Rentals the look was not complete without copper mule mugs with brownie cupcakes resting on the edge from Just One Bite Brownies. 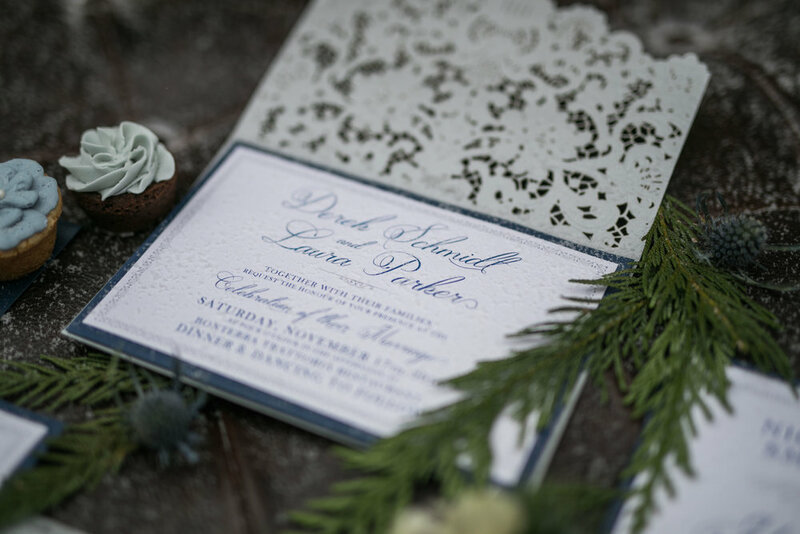 Create Love designed our romantic stationary with laser cut envelopes and navy accents. Our floral centerpiece was exquisitely designed by Amborella Floral Studio and doubled as a bridal bouquet. As a designer, Jacqueline Rae always looks at ways to help couples dream a little more and think outside of the norm and wanted to showcase a cake table in a bookshelf. This was the perfect opportunity to feature an incredible two tiered watercolored cake with gold foil accents from Handmade Cake Company. We worked with CF Interiors for the incredible furniture for the shoot from brown tuffed leather ottomens, mongolian feather pillows, warm industrial bookcase, and light tweed dining chairs. Our recent newlywed couple reached for each other every opportunity they had and love radiated from them during the shoot. We wanted a two piece bridal gown with body in the bottom and Novia Mia delivered with a lace top and full tulle skirt. Our model was beautified with a bold lip, full brows, accented wing, and a textured side braid by Avenue Beauty and wore jewels from Stella and Dot (Sara Moore). Our Groom was dressed in a pattern navy suit with dusty blue and brown accessories by Ed Williams Mens Wear. 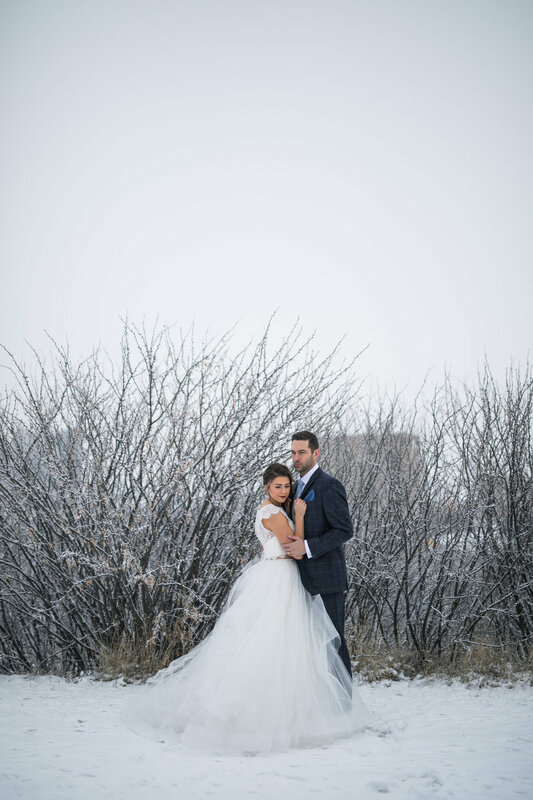 Sofia Katherine Photography photographed the chilly styled shoot beautifully with natural light and moments captured. 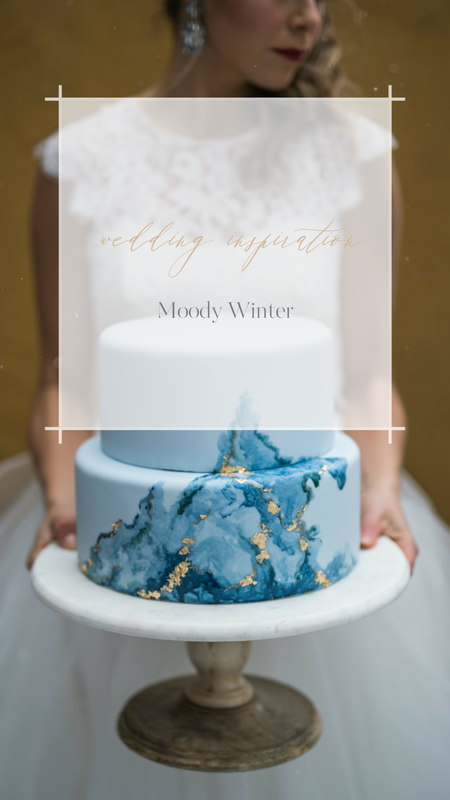 We hope you enjoyed this moody winter bridal inspiration we were so honored to be a part of.